This article is about the military term. For the publisher, see Skirmisher Publishing LLC. Once preliminary skirmishing was over, skirmishers participated in the main battle by shooting into the enemy formation, or joined in melée combat with daggers or short swords. Alternatively, they could act as ammunition bearers or stretcher-bearers. Due to their mobility, skirmishers were also valuable for reconnaissance, especially in wooded or urban areas. In classical Greece, skirmishers originally had low status. For example, Herodotus, in his account of the Battle of Plataea of 479 BC, mentions that the Spartans fielded 35,000 lightly armed helots to 5,000 hoplites yet there is no mention of them in his account of the fighting. Often Greek historians ignored them altogether, though Xenophon distinguished them explicitly from the statary troops. It was far cheaper to equip oneself as lightly armed as opposed to a fully armed hoplite – indeed it was not uncommon for the lightly armed to go into battle equipped with stones. Hence the low status of skirmishers reflected the low status of the poorer sections of society who made up skirmishers. Additionally, "hit and run" tactics contradicted the Greek ideal of heroism. Plato gives the skirmisher a voice to advocate "flight without shame," but only to denounce it as an inversion of decent values. Nevertheless, skirmishers chalked up significant victories in this period, such as the Athenian defeat at the hands of the Aetolian javelin men in 426 BC and, in the same war, the Athenian victory of Sphacteria. Skirmisher infantry would gain more respect in the subsequent years as their usefulness was more widely recognised and as the ancient bias against them waned. Peltasts, light javelin infantry, played a vital role in the Peloponnesian War and well equipped skirmisher troops such as Thureophoroi and Thorakites would be developed to provide a strong mobile force for the Greek and Macedonian armies. Celts did not, in general, favour ranged weapons. The exceptions tended not to include the use of skirmishers. The Britons used the sling extensively, but for siege warfare, not skirmishing. Among the Gauls likewise, the bow was employed when defending a fixed position. The Celtic lack of skirmishers cost them dearly during the Gallic Invasion of Greece of 279 BC, where they found themselves helpless in the face of Aetolian skirmishing tactics. In the Punic Wars, despite the Roman and Carthaginian armies' different organisations, skimishers had the same role in both: to screen the main armies. The Roman legions of this period had a specialised infantry class called Velites that acted as skirmish troops, engaging the enemy before the Roman heavy infantry made contact, while the Carthaginians recruited their skirmishers from native peoples across the Carthaginian Empire. The Roman army of the late republican and early imperial periods frequently recruited foreign auxiliary troops to act as skirmishers to supplement the citizen Legions. The medieval skirmishers were generally armed with crossbows or longbows wielded largely by commoners. In the fourteenth century, although long held in disdain by Castilian heavy cavalry manned by the aristocracy, the crossbowmen contributed greatly to the Portuguese victory at the Battle of Aljubarrota. Similarly, English archers played a key role in the English victory over French heavy cavalry at Crécy. In the next century they largely repeated the feat at the Battle of Agincourt. Such disasters have been seen as marking the beginning of the end of the dominance of the medieval cavalry in particular and heavy cavalry in general. The Seven Years War and American Revolutionary War were two early conflicts in which the modern rifle began to make a significant contribution to warfare. Its accuracy at relatively long range increasingly offered advantages over the smoothbore musket in common use among professional armies of the mid-18th century. In both those wars many American frontiersmen served in the militia. The Continental Army during the American Revolutionary War included many such irregular troops. They engaged in skirmishing tactics, firing from cover rather than in the open field engagements customary at that time. Their tactics were largely influenced by experiences fighting native Americans. The character of Natty Bumppo in James Fenimore Cooper's novel The Last of the Mohicans was notably called La Longue Carabine by the French due to his skill with the long rifle common among the Colonials. French voltigeurs crossing the Danube before the battle of Wagram. During the Napoleonic Wars skirmishers played a key role in battles, attempting to disrupt the main enemy force by firing into their close-packed ranks and by preventing enemy skirmishers from doing the same to friendly troops. Because skirmishers generally fought in open order they could take cover behind trees, houses, towers and similar items, thereby presenting unrewarding targets for small arms and artillery fire. Such tactics often made them vulnerable to cavalry however. A skirmish force screening the main body of infantry became so important to any army in the field that eventually all the major European powers developed specialised skirmishing infantry. 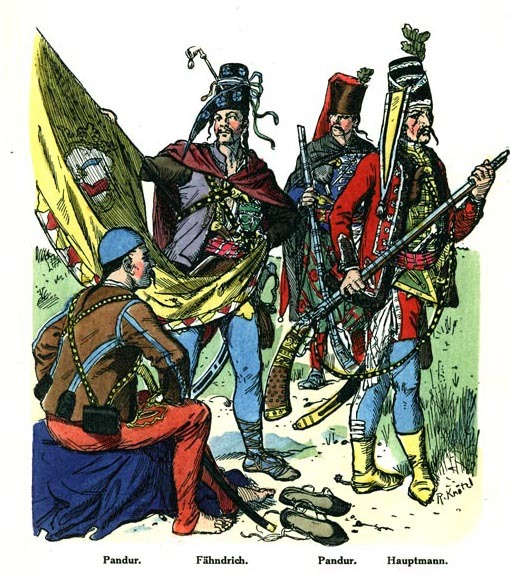 Examples included the German Jäger, French Voltigeurs and British riflemen. While muskets were the predominant weapon at the time, the British Army experimented with rifles which though slower to reload and more costly to produce were more accurate and had a longer range of effective fire. Rifles were so successful in the Peninsular War that British riflemen could selectively target and decimate the officers of often superior French forces. In the American theater, American riflemen again contributed to British casualties but now had to contend with revised British light infantry tactics. A consequence of experiences during these wars was a trend to training line troops to adopt tactics that until then had been used only by skirmishers. The treatise, New American Tactics, by General John Watts de Peyster advocated making the skirmish line the new line of battle, a revolutionary idea at the time. During the American Civil War, it was common for cavalrymen to dismount and form a skirmish line to delay enemy troops advancing towards an objective (for example, the actions of the Federal cavalrymen on the first day of the Battle of Gettysburg). By the late 19th century, the concept of fighting in formation was on the wane, and the distinctions between skirmishers and heavy infantry has now disappeared. The former Soviet Army, however, had lighter wheeled BTR-equipped motorized rifle regiments fighting on the flanks or secondary sectors of a motorized rifle division on the offensive, while heavier tracked BMP-equipped motorized rifle regiments would fight in the division's sector of main effort. In the early 21st Century, the U.S. Army has also adopted this doctrine by having light rapid deployment Stryker Brigades on wheels and heavier Mechanized and Armored units with tracked Bradleys and Abrams as main combat forces. Randolph, Lewis Hamersly, Biographical Sketches of Distinguished Officers of the Army and Navy, Henry E. Huntington Library: New York, 1905.